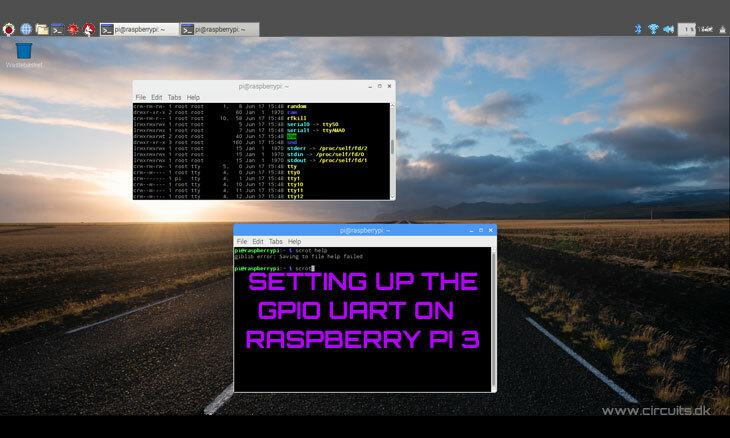 In this article we will try to setup the UART on the Raspberry Pi 3 and Raspberry Pi Zero W running the latest debian “Jessy” release of the kernel. This used to be pretty easy on the previous versions of the Raspberry Pi models but on the Raspberry Pi 3 model it is a little bit different. The BCM2837 on the Raspberry Pi3 has 2 UARTs (as did its predecessors), however to support the Bluetooth functionality the fully featured PL011 UART was moved from the header pins to the Bluetooth chip and the mini UART made available on header pins 8 and 10. Hence, the miniUART is now available on /dev/ttyS0. Now the bluetooth module occupies the UART channel /dev/ttyAMA0 which on previous models was used as the primary serial GPIO UART interface. So on the Raspberry Pi 3, the UART hardware interface used for the Bluetooth is named /dev/ttyAMA0 and the new UART connected to pins 8 and 10 on the GPIO connector J8 is named /dev/ttyS0. The mini UART is a secondary low throughput UART intended to be used as a console. 8 symbols deep FIFOs for receive and transmit. 7 or 8 bit operation. 1 start and 1 stop bit. SW controlled RTS, SW readable CTS. Auto flow control with programmable FIFO level. Baudrate derived from system clock. Generally speaking, doing this regularly will keep your installation up to date. Also be aware that downloaded package files (.deb files) are kept in /var/cache/apt/archives. You can remove these in order to free up space with sudo apt-get clean. See post on raspi org here. And follow up post on git here. If you don’t use Bluetooth (or have undemanding uses) it is possible to swap the ports back in the Device Tree. There is a pi3-miniuart-bt and pi3-disable-bt module which are described in /boot/overlays/README here. See end of this article on how to do this. You have to reboot for the changes to take effect. Thus on a Raspberry Pi 3 and Raspberry Pi Zero W, serial0 will point to GPIO J8 pins 8 and 10 and use the /dev/ttyS0. On other Raspberry Pi’s it will point to /dev/ttyAMA0. So where possible refer to the serial port via it’s alias of “serial0” and your code should work on both Raspberry Pi 3 and other Raspberry Pi’s. 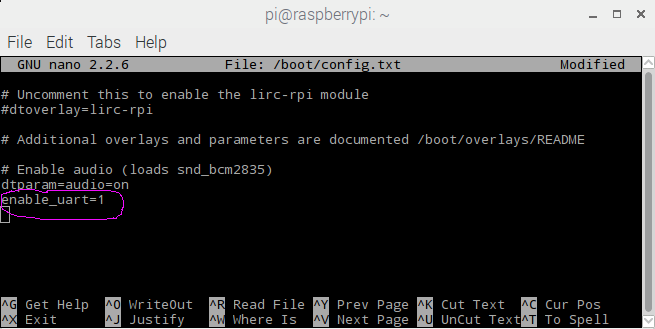 By default the Raspberry Pi uses the serial port for the “console” login and via a software service called “getty”. If you are using the serial port for anything other than the console you need to disable it. This will be slightly different depending on whether you are running a Raspberry Pi 3 or not. For non Raspberry Pi 3 machines, remember it’s /dev/ttyAMA0 that is linked to the getty (console) service. The “disable” will stop it loading at reboots. Or anything involving console= that isn’t console=tty1, remove it. Make sure not to accidentally add a line break to that file, it should remain all one line with spaces between the options, but no spaces around any =. If you don’t want to use the Bluetooth and you want that high performance /dev/ttyAMA0 back on the GPIO, you can do this via a device overlay called “pi3-miniuart-bt” i.e. use the mini-uart (/dev/ttyS0) for Bluetooth.